1 A cloud of dust rolled across the ground as the small gaggle of geese ran from one corner of the yard to the other corner, flapping their wings and honking loudly as they went. 2 "Okay, troops, all together now. About face! Ready, now let's run to the other corner," said the head gander. "Good job, troops; now let's do it again! Here we go!" 3 The flock of geese ran several times back and forth across their enclosure. 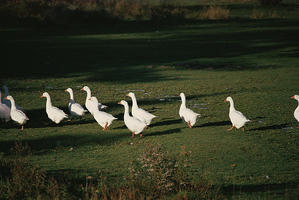 As they marched past the ducks' enclosure, one old duck hobbled over to the fence so that he could get a better look at the goose gaggle. He had to laugh at the pompous and silly head gander. 4 "Hey, Commodore, when do you reckon you all are going to find a spot to settle? You sure do stir up a lot of dust," said the old duck as he squinted up at the bigger bird. 5 "We are on maneuvers, my good duck. We have an important security exercise to practice here," said the head gander. "Someone has to look out for the flocks, and we take this job very seriously. Now that it's spring, there will be little ones around." 6 The warm spring breeze blew across the goose and duck enclosures and forced the cloud of dust to dissipate. The old duck brushed some dust off his newly preened feathers and called to the head gander again. 7 "Tell me, Commodore, where was security last week when one of the old hens came up missing and is believed to have fallen victim to the fox that lives across the meadow? And what about that hawk that flew around the pen yesterday for several minutes before any of your troops saw him? Do you call that good security?" 8 The Commodore lifted the monocle that he held in his wing and used it to peer at the old duck as he waddled over to the fence. 9 "Now see here, my good duck, we are investigating those matters, and there is no evidence that our security measures were in any way at fault," replied the head gander. 10 The old duck and the head gander wrangled back and forth for several minutes and drew the attention of the rest of the ducks and several of the chickens. Then the rest of the geese waddled over to the fence to watch the verbal fight. 11 It didn't take long before the geese lost interest in the argument and wandered off to patrol the fence perimeter. 12 One of the female geese saw a bit of movement in the corner of the enclosure. She told the goose beside her, and the two waddled over to the corner to investigate.